My best tenor: a vintage Selmer Mark VI from 1957. The most complete saxophone when it comes to sound, feel, design, playability and quality of material. This type was introduced in 1954. Serial number: 70xxx. Prices go sky high. My fancy but not to underestimate Leopard horn. 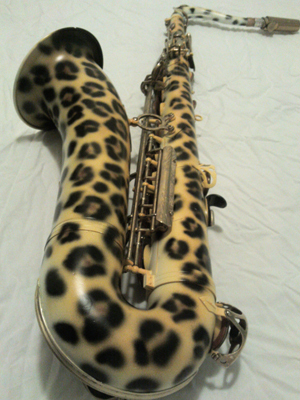 This is a Selmer USA TS-100 tenor sax that I airbrushed myself. 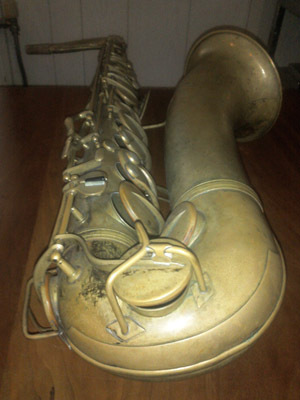 This sax was brought on the market by Selmer USA in the 80's, but only for a very short period. This sax has a big sound and is build/feels almost like a Mark VI, but is heavier. The E-flat and C-keys are positioned uncomfortable. My repair man solved that inconvenience by placing the thumbrest a little higher. Serial number: 827380. Many thanks to Eric van Dorp and Eric Buitelaar of Akzo Nobel Car Refinishes Sassenheim (the Netherlands) for applying the primer, basecoat and final clear coating. Soon after I started playing, I bought an old American saxophone in 1992. This was a Conn 10 M Ladyface (also known as Naked Lady). This one was build in 1935 and the serial number is 265026. 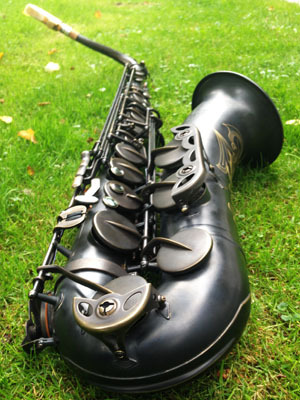 An amazing legendary saxophone with a full bodied, but very flexible sound. 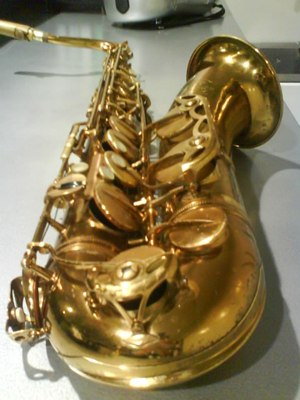 All jazz sax masters of the past have played this sax (a.o. Dexter Gordon) Soundwise this Conn is a totally different world when you compare it with a Selmer Mark VI. The feel of blowing is different too. With this Conn you can create a more outrageous and bended sound. Comfort of the keys is a bit less than a Selmer, however still very fast. Surprisingly good saxophone made in China. Nice sound on the darker side. They probably didn't use the best pads, springs and corks but this is a decent, good sounding instrument at a affordable price. No lacquer, just chemically treated to make it black. Richard Sax Ross (RSR) was involved in the development and the Chinese people that worked on this horn did a great job. An Otto Link mouthpiece allows you to create your own, various sounds. You can go from bright to warm, with edge or mellow. But you have to make an effort to maintain that sound, especially when you play large tip openings. You also have to deal with the reed problems, it's hard to find a good working reed.Often it's not the reed that causes trouble but the combination with the mouthpiece. A reed that doesn't perform on your big tipopening Otto Link might function quite well on another mouthpiece. For a nice and reliable history of Otto Links visit the site of mouthpiece Guru THEO WANNE. Right from the start of my musical career I have blown a metal Otto Link. At first a size 9* and very soon a 10*. This is about the largest playable opening. There are (rare) bigger openings: Hans Dulfer (who put me on track of Otto Links) has a size 14 in his collection! The current Otto Links are fine mouthpieces, though the quality varies enormously. The picture is of my first Otto Link 10* a "Super" Tone Master U.S.A. I still have it. OTTO LINK "SUPER" TONE MASTER U.S.A. FLORIDA 10*, BUT MEASURED 0.137"
Fantastic piece. My favourite so far. Very big sound and also sounding good on the high notes. Harder to play than a Florida No USA or a current Otto Link. But beautiful! The deepness of sound can be heard on my ballad album MOODPRINTS. I believe every tenor saxophonist should have this piece in his sax case. If not as a main piece, it would be a a great backup. This plastic high baffled mouthpiece playes effortlessly, very loud and also allows you to produce a good tone. See DRAKE WEBSITE. Gottsu is a remarkable mouthpiece manufacturer from Japan. They started with making rare bamboo mouthpieces. I own one of these too! But nowadays they make amazing mouthpieces out of metal and hard rubber, pieces that can compete easily with expensive vintage mouthpieces out there. They are probably even better! I got their unbelievable 'Master' a succesful recreation of the legendary Otto Link 'Master' Link. The one that Ben Webster played. BIG chamber and no baffle! They did a great job and also managed to 'translate' the Master Link concept to my favourite 10 tip opening size. I simply love this mouthpiece. Thank you Gottsu! I owned a lot of other mouthpieces, like Guy Hawkins 10**, Theo Wanne Gaia 10, Amma 10, Ambika 10, Parvati 10, Sakshama Dukoff Zimberoff 9, Landreth Zephyr 0.125, Vandoren V16 hard rubber 11, Vandoren Java T97, Vandoren Java Jumbo T97 blue, Otto Link Masterlink 3, Otto Link New Vintage 8, Dukoff Hollywood 7, Dukoff L9, Dave Guardala Studio, Ponzol (Ria) 8, Brancher, Claude Lakey hard rubber 9, Claude Lakey metal 9, Phil Barone Hollywood, Lawton 10* B, Berg Larsen 140, Johnshock Vintage and many more..